I have made lip balm but not sure about one thing. I used watermelon flavoring and also tried essential oil. Someone said not to use essential oils. Is it ok to use flavoring, I bought it where I get essential oils, they aid its for lip balm. Could you use flavors you use for cakes or in baking? I’m sure you can, but I don’t personally recommend it because flavorings are usually full of artificial ingredients. I use high quality essential oils that are safe for using in a recipe like this. 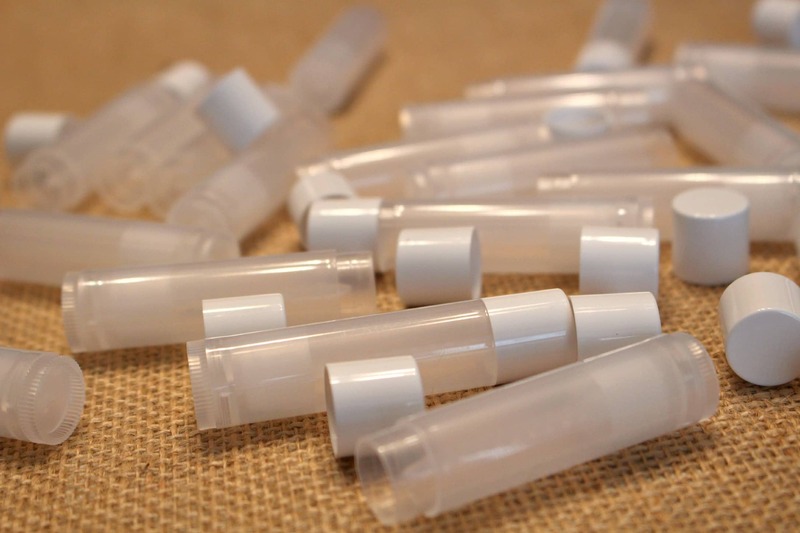 What types of fragrance oils can you use in lip balms? I also make soy candles so can I use those fragrance oils in the balms? 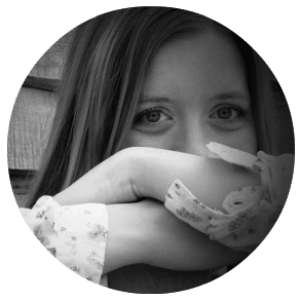 I would definitely avoid fragrance oils in lip balms – simply because of the chance of eating artificial fragrances. I prefer to use small amounts of high quality essential oils. I love these! I tried to make lip balm years ago and it ended up all chunky. I wonder what I was doing wrong. 🤷‍♀️I thinj it’s great your going the natural route and I can’t believe how inexpensive they are. I’ll have to make a batch and give them out for Christmas gifts this year! I like to use a small amount of vanilla extract in my lip balm concoctions. It smells divine and tastes pretty good, too! Also for badly cracked lips which I am prone to I add a small amount of calendula infused oil to the mix, very healing for sore skin. I love the smell of Almond… can Almond Extract be used? Can’t wait to try this recipe and give these out to family/friends as gifts!! This is only fueling my arts & crafts passion and chap stick addiction (seems like the perfect storm) :o) thank you!! I’d be concerned the liquid almond extract won’t blend and emulsify with the oils. Wouldn’t almond extract work the same as the vanilla extract someone mentioned above? It might with a very small amount. I haven’t tried it, so I can’t guarantee it. I live on lip balm also, lol. I’m wondering about the melting point, as coconut oil gets soft at room temp. If I carry this in my pocket will it melt all over my jeans? 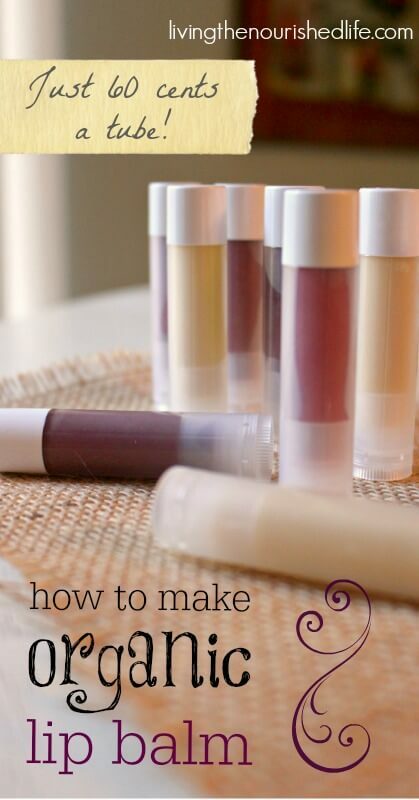 This is a great tutorial, and has really spurred me to decide to make lip balm. I checked out the amazon link you provided for the lip balm containers, and I think this is a project I must do soon! I love making chapsticks & used hibiscus powder recently, but it turned out more grainy and the tint didn’t seem to transfer to the skin well. 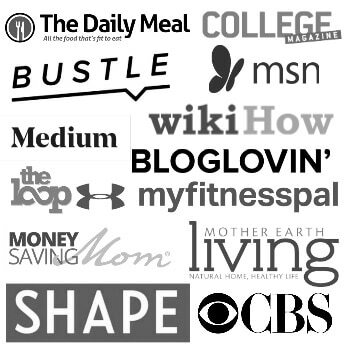 Is there something I could be doing wrong maybe during the process or is there a brand that you recommend for best results? I didn’t use much powder, and the one I used was very fine, so I didn’t have any trouble with a grainy texture fortunately. So sorry about that! I’m not sure what went wrong. I infuse my colorants in the oils I’m going to use so i don’t in the risk of grainy lip balm ? Put the powder into a food processor or a coffee grinder and grind into a finer powder. This is what I do and it works great. 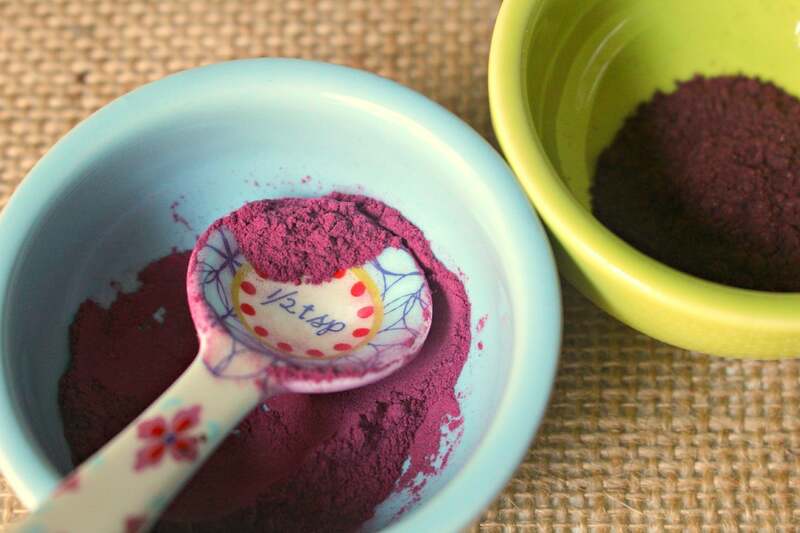 My friends and I found a way around the hibiscus powder not dissolving and thoroughly mixing. We put the tint powder in a disposable tea filter. Once the oils were melted, we let the tea filter sit in the pot for a few minutes while continuously stirring over the double boiler. We left the filter in until we got the color we were looking for. Loved the final product! Will definitely make it again. Could I use flower essence flavoring? I believe it is a special processing in which they are able to capture the flavor without any additives. That might work – depends on whether they’re oil soluble. Excited about my chapstick I made tonight with wintergreen and lavender! Smells so great! Be very careful with wintergreen. It’s primarily methyl salicylate and can be poisonous in relatively small quantities in smaller children. Robert Tisserand recommends no more than 1% maximum solution for this oil as a topical product like lip balm. This recipe is about 8 tbsp, should be 120 ml or so. I prefer recipes that use weight as they’re more consistent but at 120 ml, that would be no more than 24 drops of wintergreen. At the recommended 30 drops total in this recipe you should be ok since some will be lavender, but anyone who should be avoiding aspirin for any reason should not use this particular lip balm. (Essential Oil Safety, Tisserand and Young, pp 469-470). Are there any substitutions I could use for beeswax? My husband is allergic to almost anything related to bees! I would google “beeswax alternative” – I haven’t done a lot of research in this area, but I think there are some other options. I use candelilla wax. It’s vegan. I’d also love to know about a beeswax alternative for a vegan option. Thank you! A beeswax alternative would be carnauba wax, which is from a palm tree. 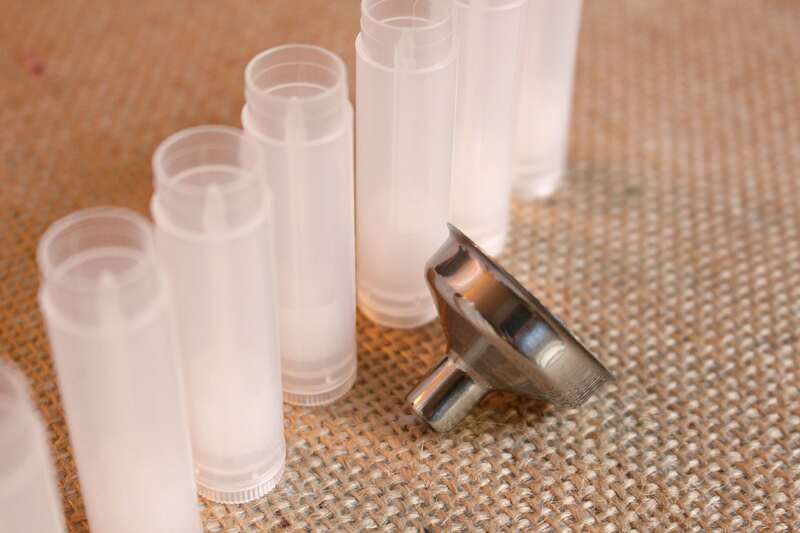 You can use candililla wax at 80% by weight in place of beeswax in any lip balm recipe. Seems to be a tad shinier, not a bad thing unless you’re making it for a guy; most of my guy friends prefer a more matte formula. I’ve made a similar recipe before, and I added a little honey (good for skin overall) and a little Vit. E oil. 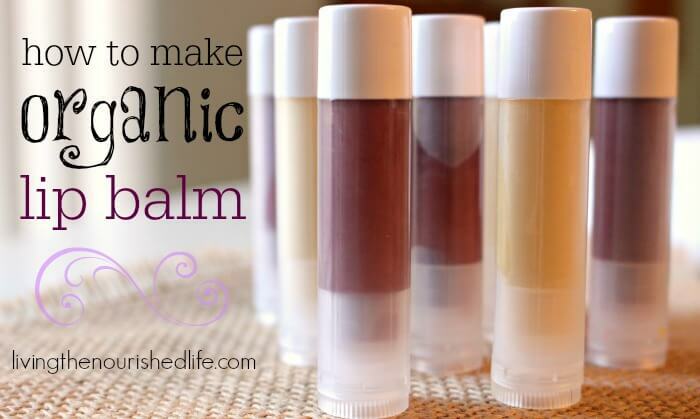 I love how easy it is to make lip balm! Never tried the color tint though. Will next time! Hi I am looking to get a wonderful brownish tint like Burts Bee’s Cocao which they have discontinued. what would you suggest kind regards jennifer Really looking forward to doing this. I’ve read of using cocoa powder for these types of recipes, so a combination of that and maybe a little beet root right do the trick. 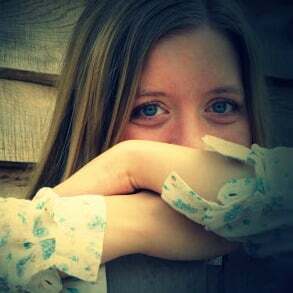 Great tips, thank Elizabeth Walling! ho! I’m so excited for my ingredients to come and get to making these! I’m just wondering though if adding 1 or 2 drops of oil to each tube prior to adding the mixture would have the same outcome? I’d like to get multiple flavors out of one batch. Thank you! Candace, that’s a good idea! It might work – I’m note sure the EOs will mix completely, but they might. Well, I have an update 🙂 I made 5 different flavors from one batch! The oils blended wonderfully, I’m so happy! I did come up 9 tubes short though. Would you happen to know how many grams of co and wax it is? I buy my wax in bricks, so it’s hard to get an exact meurement. Thank you! Hey, just wondering, did you add the oils to the tubes before or after you had dumped the wax in them? I am wanting make multiple flavors and am not sure how to do it! Thank you! Question, I just did this cause I was REALLY bored*, but can you just use straight up coconut oil? No, the coconut oil will melt very fast, especially if it’s hot where you live. Also, when you touch it to your lips it will just melt all over you. Hope this is helpful! ?